— What is the weight of the canvas? Economy canvas may be a lighter weight (thickness)s, 7oz instead of 10 or 12oz. 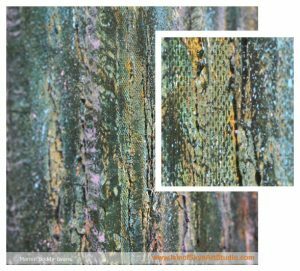 With larger paintings and ones with a lot of texture paste or collaged elements added, heavier canvas will be more resistant to tearing. — How prominent is the weave? How thick or noticeable are the threads of the fabric? On smaller paintings, portraits, and detailed subjects you don’t want the grain to intrude, be one of the first things you notice when you look at a painting. It’s why portrait painters often use fine linen canvas which has a very tight weave. Primer will fill in the weave to some extent, especially if it’s several layers, as will thick paint. — How well has it been primed? Look at the quality of primer/gesso, how many layers and how smooth it is. At it’s worst it’s thin and rough. With oil paint, primer is essential for longevity as it protects the fabric from the oils in oil paint. With acrylics, you can paint directly onto bare, unprimed canvas, though paint does soak in more as it’s an absorbent rather than sealed surface. On cheaper canvas Using acrylics to create a coloured ground rather than adding additional primer is also an option, even with oils (provided the acrylic isn’t too glossy). I’ve encountered instances of acrylic not sticking in places (and, yes, it was one primed for acrylics), with white specks appearing; adding some glazing medium to the paint solved the problem. Ultimately it’ll all be covered with paint and no-one but you will know; experimentation will teach you what kind of surface you like. — Has the canvas been stretched straight, tightly, and evenly? Eyeball the fabric where it goes around the stretchers, to see if it’s been pulled skew or not. On small canvases it’s not really a problem if you’re going to hide it under thick paint, but on large it’s again a longevity issue as it adds extra strain to the fabric (and it may eventually rip). Is it pulled unevenly or sag at the corners? — Where are the staples and has the fabric been folded neatly at the corners? Is it stapled at the back (where you don’t see them once the painting is hung) or the sides (which will show unless you frame the painting)? — What wood has been used for the stretchers and how thick is it? Very lightweight and thin stretchers are liable to warp. Pine stretchers with knots may seep (though I’ve only seen this a few times). Are the stretchers flat or do they slope away from the edge so a brush doesn’t hit it as you paint? I’ve had problems with large (1x1m) budget canvases warping as the wood dried out in a hot summer, as well as with warping due to the canvas being stretch too tightly on a couple of mid-sized canvases that were supposedly artist’s quality. — On large sizes: how many additional struts to help prevent warping? Always look for discounts on offer if you buy in bulk (a boxful) rather than only one or two at a time.When comparing prices, factor in the cost of extra primer and the time it takes to apply; it may be false economy. You can also save money by stretching your own canvas, particularly if you make the stretcher bars yourself. Get a length of 2×1″ from a DIY store (check it’s straight! ), mitre cut lengths, use corrugated nails (inch-long zig-zag bits of metal, a bit like a crinkle-cut crisp) to join them,?sand down the inside edge of the stretcher (so your brush doesn’t bump up against it every time), then stretch canvas over it. A pair of canvas pliers and staple gun are definitely worthwhile investments, and it’s considerably easier if someone strong is helping you. Look for a roll of canvas at a fabric shop rather than art supplies, it can be cheaper. What I Use: Ready-made canvas in a few different sizes, mostly wide-edge rather than standard. The brand depends on the best offer at the time.? I also sometimes buy stretcher bars to make up larger canvases, and at one stage did make my own from scratch, but applying several layers of primer is even less interesting than watching paint dry. I cut my own stretcher bars (you select the size you want). I buy muslin in a fabric store and then coat it with gesso. I first cover it horizontally then vertically. For medium and heavy duty ‘canvas’ I buy real linen sheets at brocantes (car boot/garage sales) here in France. They are incredibly cheap (1 or 2 euros at most) for a full size sheet. Doesn’t matter if it’s got a few red ‘iron’ stains. From time to time I find sheets with embroidered initials or, more common, very neat darns and repairs; it all adds to the accidental texture in my type of abstract painting. They stretch beautifully too. It’s nice to paint on something with a history – perhaps, though, not a history one would want to hear! Great idea! Now if only the British used linen sheets rather than thin polycotton!! I love the thought of embroidery and handrepairs in the canvas… a bit of history as you say, and texture… and a mystery for some future art conservationist! I use a matt acrylic as underpainting and additional ground on medium priced canvas. These matt acrylics are made for this and provide a good painting surface for either acrylics or oils. they are medium priced and of good quality. they will help to stretch your support budget. Some time ago I got two rather controversial recommendations. 2. paint at least 100 paintings per year. OK. Thanks to Marion training I know what is deemed to be the best in terms of paints. But what about “the best quality canvas”? Is it “professional” to use cotton canvas, or it is deemed to be a bad practice an acceptable if you are planning to become a successful artist? Best quality materials… I agree, go with the best quality you can afford to use. Afterall, you’re expecting someone to pay for the painting, and if you were buying it you’d want quality. But also because artist’s quality paints have superior pigment loading, and are a delight to work with; this pleasure shows through in a painting. Consider it an investment in yourself. Realistically money is an issue, so stretch a budget by using mid-price paint in the lowest layers (avoid the really cheap nasty stuff) and artist’s on top. Also look at what series a particular colour is… don’t use a Series 6 colour as an undercoat!! Paint 100 a year… think it’s just “paint lots” as we learn through practice. I hope that Windsor &Newton Gallery is good enough, is not it? I will change then to Iranian cotton canvas on steady stretchers instead of cotton Chinese canvas on light stretchers. W&N is a reputable brand, and I use their canvas amongst others. I have had problems with paint not sticking at times though, forming irritating tiny white specks. I just read your article about stretched canvas. What do you think about using canvas, or linen, boards for oil paintings? It depends on the quality; what’s used to glue to canvas down on the board, and what the board is made of (e.g. cardboard). Warping is one of the issues, particularly on larger sizes; the glue coming unstuck is another, and yellowing through the painting. Don’t cheat yourself by compromising on quality of the support; it’s fundamental to the whole painting. Consider the DIY route: buying a large sheet of wood, getting it cut into sizes, and priming it. 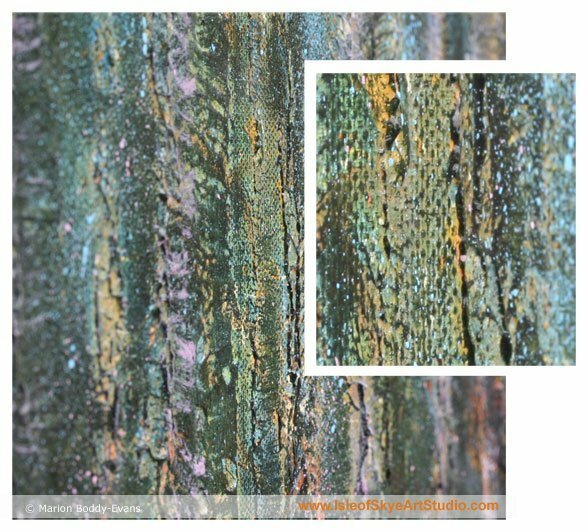 Canvas adds texture to a surface, but it’s not a requirement for a painting by any means. On larger sizes there are arguments to be made for a more rigid support, for serious long-term longevity.